The Vulcan RM Shoes have a conventional concave design that incorporates many necessary modern day features. The Vulcan shoes come in front and hind patterns that help eliminate some issues caused by the "one-style-fits-all" shape of many kegs shoes on the market today. The shape of the Vulcan's allow farriers to achieve a better fit more quickly because the shoe is designed to fit around the coffin bone with few alterations, meaning the widest part of the shoe aligns with the widest part of the foot quite well right out of the box. 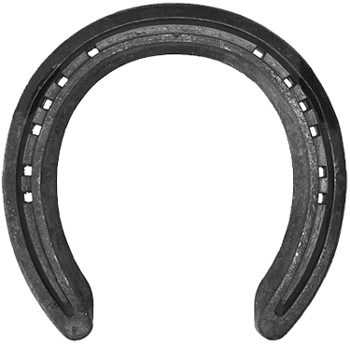 In cases of minor lameness issues caused from excessive strain, leverage, and/or hoof distortions, the Vulcan shoes incorporate many features that have proven to help relieve or overcome these lameness problems.